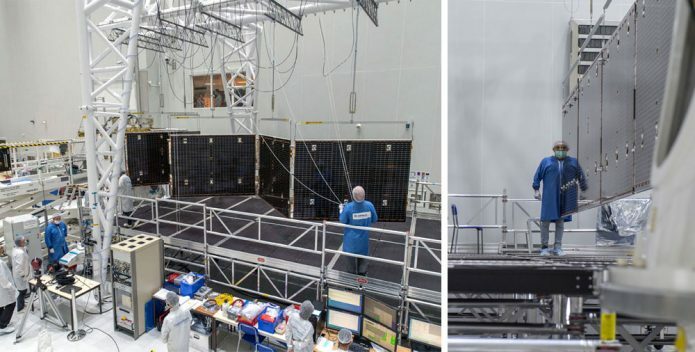 One of two solar arrays on BepiColombo’s Mercury Transfer Module is opened during testing in the Spaceport’s S5C clean room high bay (at left) and is inspected after full deployment (photo at right). BepiColombo’s Mercury Transfer Module (MTM) – which is part of a multi-part spacecraft composite to be launched by Ariane 5 in October for exploration of the solar system’s smallest and least-explored terrestrial planet – has undergone tests at the Spaceport in French Guiana to validate the deployment process for its two solar arrays. These two arrays – one installed on each side of the module – were opened with the use of an overhead rig that helped support the solar panels as they extended to their full length, simulating the low gravity conditions in space. The activity took place in the SC5 clean room high bay, which is the largest hall in the Spaceport’s S5 payload preparation facility. To be launched on Arianespace Flight VA245 on October 18, BepiColombo consists of four elements: the Mercury Planetary Orbiter (MPO), a three-axis stabilized spacecraft tasked to study the planet’s surface and internal composition; the spin-stabilized Mercury Magnetospheric Orbiter (MMO), which will provide data on Mercury’s magnetosphere; the Mercury Transfer Module, providing solar-electric propulsion on the trajectory to Mercury; and the MMO Sunshield and Interface Structure (MOSIF). The European Space Agency is responsible for the overall BepiColombo mission design and integration of the various spacecraft elements, and it provides three of the components: the MPO, MTM and MOSIF. Japan supplies the Mercury Magnetospheric Orbiter, which is provided by the country’s Institute of Space and Astronautical Science (ISAS) and the Japan Aerospace Exploration Agency (JAXA). The composite spacecraft “stack” will make its first flyby of Mercury three years after launch, followed by separation of the Mercury Planetary Orbiter and Mercury Magnetospheric Orbiter to circle the planet – providing data that will provide new insights of the planet as well as the solar system’s formation. The three additional elements for BepiColombo’s multi-part spacecraft composite also are being readied for launch in the Spaceport’s S5 payload preparation facility. Shown at left is the Mercury Magnetospheric Orbiter (MMO), followed by the MMO Sunshield and Interface Structure (MOSIF) (center photo), and the Mercury Planetary Orbiter (MPO), at right.